Get a top body in under 12 weeks! 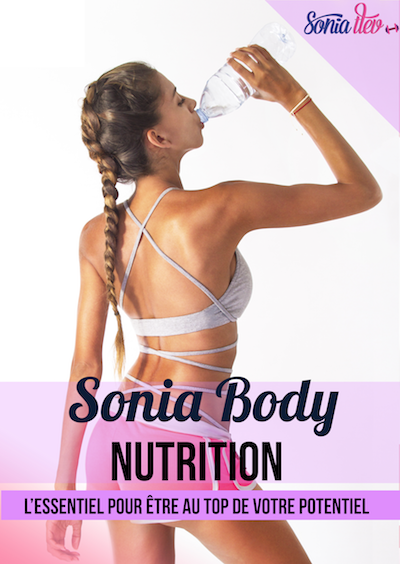 Buy my Sonia Body Training! Day after day, browse through the different programs and enter your measurements to see progress! 30 minutes is the ideal length for a daily session, and it is a length that everyone can fit into their schedule. Why hesitate? With Sonia Body Training programs, optimize your time with adapted exercises and become a new version of yourself! Have you have tried everything without results? GET A TOP BODY IN UNDER 12 weeks thanks to my Program. Thousands of women have already said YES! - 12 exclusive weeks of training accessible to beginners - Only 30 minutes of training per session - Progressive levels, and exercises that come with diagrams and explanations. - Videos of exercises for full understanding - Adapted for all body shapes/sizes - Eliminate stored fat, tone your body and build muscle - Program specialized for at-home workouts - A program that works every part of your body - Section dedicated to moms - Section dedicated to slim people who want to build muscle and get toned without losing weight. - Equipment: jump rope, two 2 kilo dumbbells, a floor mat Thousands of women have rediscovered the BEST VERSION of themselves with this program. For optimal results, it is essential to understand how your body works and eat a balanced diet. - Advanced advice for comprehensive diet adjustment - 4 weeks of sample menus to allow you to prepare your own meals by following the diagrams. - Savory and sweet recipes that are easy to make - Balanced nutrition to refuel your energy - Learn how to eat, when and in what quantities - Tips and advice to reach all your goals - Adapted for people who have no knowledge of nutrition Prepared and validated by a nationally qualified French nutrition expert and a nationally qualified French dietitian, specially created to use with SBT 1, 2 or 3. 12 weeks of menus to support you in your exercise challenge with simple and balanced meals without being restrictive! - 12 weeks of full menus from Monday to Friday - 10 days of bonus fitness menus - 10 days of bonus special cardio day menus - Basic nutrition advice - List of healthy foods to eat without feeling guilty - Simple, inexpensive and readily available foods - Bonus: Some delicious and easy to make recipes An exercise program and a balanced diet go hand in hand, change your lifestyle to get results for life. Prepared and validated by a nationally qualified French nutrition expert and a nationally qualified French dietitian, specially created to use with SBT 1, 2 or 3. Top Body Challenge 3, weeks 24 to 36, is for people who have completed SBT 2 who have a high level of fitness. - 12 exclusive weeks of at-home training - Only 30 minutes of training per session - Videos of exercises for full understanding - All the exercises come with diagrams and explanations for full understanding - Only for people who are fit and exercise often - Eliminate stored fat, build muscle, tone your body, gain exercise training knowledge and more - Adapted for all body shapes/sizes - Section dedicated to moms - Explanations, advice, tips to help you continue to train and create your own routine at the end of SBT3 - Equipment: jump rope, two 4 or 6 kgs dumbbells depending on your level and a floor mat, optional: 2kg ankle weights Thousands of women have rediscovered the BEST VERSION of themselves with this program. Save money by choosing a pack instead of buying them individually! Log on to the Sonia Tlev application and become a new version of yourself!